Are you looking for a not-to-sweet, almost-pound-not-quite-coffee cake? This apple cinnamon loaf is absolutely delicious loaf and takes no time at all to put together. This recipe is a great base for add-in’s such as raisins, cranberries or walnuts but it’s perfectly fine all by itself and goes great with a nice cup of coffee. Cinnamon and apples swirled together for the perfect afternoon delight! 1. Preheat oven to 350F, prepare 9x5 loaf pan. 2. mix brown sugar and cinnamon together in a bowl. 3. Beat white sugar and butter until smooth and creamy. Beat in eggs, 1 at a time; add vanilla extract. 4. Combine flour and baking powder together in a bowl; stir into creamed butter mixture. Mix milk into batter until smooth. Pour half the batter into the pan, add half the apples and half the brown sugar mixture. Lightly pat apple mixture into batter. Pour the reaming batter over apple layer; top with remaining apples and brown sugar mixture. Lightly pat apples into batter; swirl brown sugar mixture through apples using a spoon. 5. Bake for 30-40 minutes or until toothpick inserted in the center of the loaf comes out clean! Butter can be substituted with unsweetened apple sauce for a lighter option. This recipe double well so it’s perfect for sharing and for an added touch drizzle melted caramel on the top! OMG with fall coming this so perfect for a weekend snack for son. Warm apple cinnamon bread with tea. I’m glad I read this AFTER lunch. I’m excited to get home and test this out. I bet your house smells wonderful! Yum! With Fall right around the corner this Apple Cinnamon Loaf sounds PERFECT! I am a big fan of apple, cinnamon and bread. Lots of bread. Thanks for sharing your recipe! I love how apples and cinnamon smell when they’re cooking. I’d love to give this a try too. It’s going to be apple season here soon and this recipe is perfect timing. My husband loves everything apple: crisp, bars, sauce, pie, and breads! 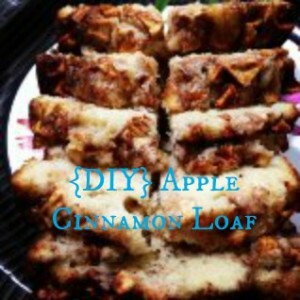 I’ll definitely be trying this apple cinnamon loaf! i LOVE Apple season is almost here! Anything baked with apples and cinnamon are a total hit in my house and this sounds delicious! Apples and cinnamon are a great combination. I think this would be a really tasty recipe. I might try this one at home myself. I love a snack like this for breakfast with English breakfast tea. It would be so nice to have a loaf of this ready for the week. This sounds so good to me right now~! I just canned up a bunch of apple pie filling today. Have some apples left. will make this. That really sounds good. Apples will be in season soon and this is a recipe I will certainly look forward to trying. this sounds like a dessert that I could actually make – i’m not such a great baker! It sure sounds delicious too! Yum! This looks amazing! I think I’ll have to make some for back to school this week! Yum. Apple cinnamon is my favorite (lemon too) I would love to make this. Sounds just amazing! I love ushering in fall with the baking of all things yummy! This apple cinnamon loaf if going to be on my list! What an awesome fall recipe. I’d use it for a snack or I’d put it in school lunches. Apple cinnamon is amazing. My husband is huge apple fanatic….pies, cobbler, crisp…and I know he’d love to try this loaf too! Thanks for sharing what seems like a pretty easy and really tasty recipe! I love apple loafs! Picture’s a little blurry but it seems like it would be great for the holidays! i always use this repcie when making homemade white bread! its great! give it a shot!Soft Fluffy White Bread1 2/3 c. water2 Tbsp. sugar2 Tbsp. light olive oil (NOT extra virgin, it is too strong of a flavor for this bread)1 1/2 tsp. salt4 c. bread flour (don’t try to use all-purpose, it won’t work not enough protein in the flour)1 heaping Tablespoon Vital Wheat Gluten (I buy this at Wal Mart right near the yeast and flour)Put the ingredients into your bread maker in the order suggested in the manual. Select the DOUGH cycle. When the dough is done, punch it down, divide it in half, form it into loaves and put it into buttered loaf pans. Cover it and let it rise about 45 60 minutes. Heat your oven to 350 degrees. Bake bread for 45 minutes. Remove loaves from oven and cover with a kitchen towel for about 10 minutes or until you can easily shake the loaves out of the pans onto a cooling rack. When bread is cool enough to handle, put into plastic bags and tie shut, or you can slice the bread with an electric carving knife at this point and then put it in bags. * NOTE: For added nutrition, you can substitute 1 c. of whole wheat flour for one cup of the white flour. You will still get a nice soft loaf, but it will not be completely white. This sounds delicious. I may add this to my Thanksgiving menu. This is perfect for apple picking season! I love anything with apples. I have to give this a try. I keep seeing all these super yummy recipes and while I love them I’m stuck because of my allergies. I can’t eat apples. 🙁 Looks delish though! Awesome snack to have,. I could eat it all right now. The apple cinnamon loaf sounds like a perfect fall treat! Thanks for the recipe, I would love to give this a try! Hmmm, not sure I use raw sugar rather than white and that works, but I spsuect it does add some of the bulk that a sugar substitute wouldn’t but heck, it’s easy enough to try. This sounds really good. It would be great for breakfast with a cup of coffee. I make a similar loaf without the apples for my kids in a gluten free version. Will have to add apples next time to try it. This looks absolutely delicious! Apples and cinnamon are perfect to ring in fall. I totally agree with you. Fall is such a short season here so we need make the most of it while we can! That sounds so delicious. I’m sitting here trying to figure out how to make one magically appear right now. When you find out…let me know! Ours is almost all gone and I only got one slice! I could too! It is that good!